Coach's Corner - Ted Williams hand signed Red Sox BB card. 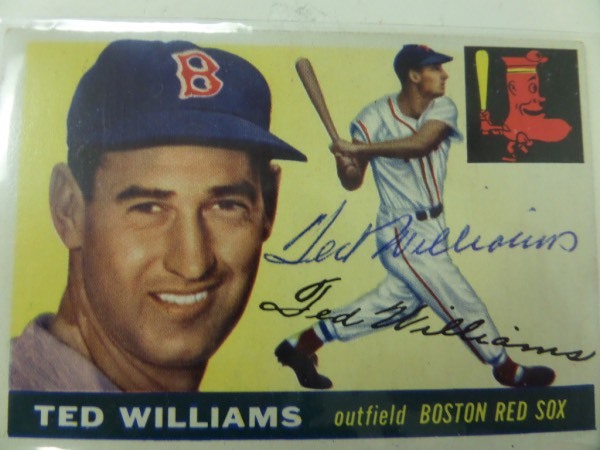 Go Back to Lot List Ted Williams hand signed Red Sox BB card. This 1955 Topps BB card is card #2 and shows Ted in 2 color poses. It is in great shape as a BB card, and comes blue ink signed by Ted as well. That HOF signature is an honest 8.5 and value all over is middle hundreds on the late great HOF Fenway Park Legend.